Cleans to remove embedded dirt, polishes to create a high gloss, and seals for ultimate protection – in ONE step! Wolfgang Uber All In One is the single product that will revolutionize the way you detail your vehicle. Engineered to clean, polish, and seal paintwork in one step, Wolfgang Uber All In One replaces the need for 3 separate products without compromising shine or longevity. 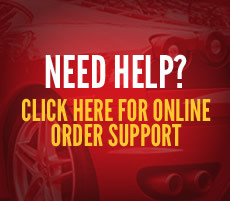 Wolfgang Uber All In One is a time-saving solution for those that don’t want to invest in multiple steps or spend days detailing their vehicle. Wolfgang Uber All In One is the only product of its type that doesn’t compromise paint protection – a single application lasts up to 6 months! Wolfgang Uber All In One cleanses paint to remove embedded dirt, polishes it to remove light swirl marks and water spots, and seals it for lasting protection. This means Wolfgang Uber All In One replaces a pre-wax cleaner, light polish, and sealant! 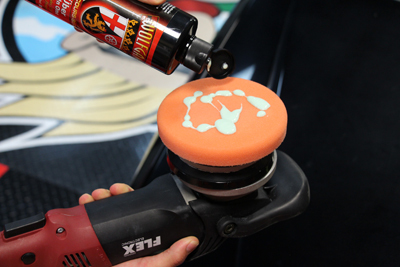 Apply Wolfgang Uber All In One with a foam polishing or cutting pad on a dual action polisher. Wolfgang Uber All In One has a smooth buffing cycle and easy wipe off. Wolfgang Uber All In One contains an advanced blend of cleaning agents that remove embedded dirt, previously applied waxes and sealants, road film, and basically anything else that would prevent the sealant from adhering to the paint. Simply put, the cleaner the paint, the greater the shine! Wolfgang Uber All In One removes the types of contaminants that regular washing does not. Wolfgang Uber All In One features the same type of micro-fine abrasives that polish your paint to a brilliant, glossy finish. 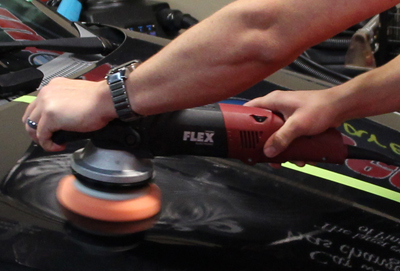 While they’re not designed to be aggressive in their cutting ability, the abrasives found in Wolfgang Uber All In One will remove light swirl marks and water spots when applied using a foam polishing or cutting pad on a dual action polisher. The most impressive feature of the abrasives found in Wolfgang Uber All In One is the fact that they won’t cause micro-marring or hazing on soft black paint. Find another all in one or cleaner wax that can make that claim! Wolfgang Uber All In One protects paintwork with the same fortified polymers that are found in other Wolfgang sealants and waxes. These German Super Polymers blanket your paintwork in a clear protective coating that is able to withstand extreme climates. These polymers have an outstanding anti-static property that repels water, oil, dust, and other contaminants to keep your vehicle cleaner in between washes. The tight, round water beads created by Wolfgang Uber All In One will surely make you the winner of any beading contests! Wolfgang Uber All In One can be applied by hand or machine. For best results, apply Wolfgang Uber All In One using a foam polishing or cutting pad on a dual action polisher, like the Porter Cable 7424xp or FLEX XC3401. 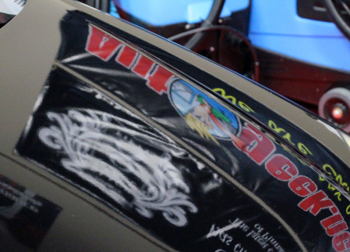 The German Super Polymers found in Wolfgang Uber All In One are oxygen activated which means you must let the product dry to a haze before buffing it off. This only takes a minute! If you’re working on oxidized paint, apply the product and then wipe it off immediately. Apply a second light coat and allow to dry to a haze before removal. 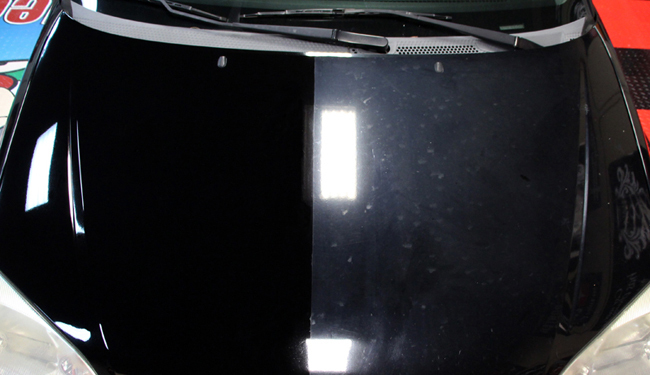 Check out the hood of this 2001 Ford Focus: The left side has been polished, the right side has not. After years of neglect, the paint was dull, faded, and oxidized. In one step, Wolfgang Uber All In One cleaned the paint by removing embedded dirt, polished the paint by restoring the richness and color, and sealed it using a complex blend of German Super Polymers. To ensure maximum longevity, keep the paint away from moisture for 4 hours after applying and removing the product. 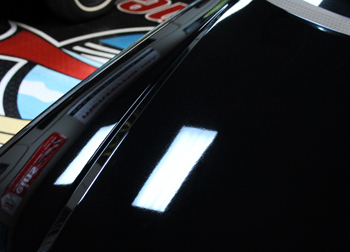 For the ultimate deep gloss finish, apply two coats of Wolfgang Deep Gloss Liquid Seal after the All In One has cured. Your paint will look like a pool of ink! Wolfgang Uber All In One 32 oz. Wolfgang Deep Gloss Liquid Seal 8 oz.